So you’ve written your masterpiece, had a friend look it over for errors, run it through your word processor’s spell check and created a cover with a “cover program” on your publishing company’s website. You are ready to do battle in the marketplace. Hey, you should be able to go head-to-head with any other book, right? Words, paper, color cover, what’s the difference? You aren’t bound by all those old rules, you are the future, right? You’ve got an ebook that tells you how to create a book in Microsoft Word, and you think you’re just going to rocket past the books by those old fogies in New York or wherever they are. Sometimes a self-published book succeeds beyond anyone’s wildest dreams. These stories are told over and over, helping to induce millions of writers to flood the subsidy publishing companies with their books, trying to get a piece of the publishing pie. But unless you’ve managed to find a niche that no one else has ever written about, or you have the only book in the world on parachute folding, or you are the next J.K. Rowling, your book will have a tough road ahead of it. Why? You are being outclassed on every front by your competition, that’s why. Here are three reasons you will be buried by the established trade publishers using the “Old Model” of publishing. They have better quality. Guess what? People do recognize differences in quality. At Old Model Publishing, they are able to anticipate sales of several thousand copies for even their most modest offerings. Consequently, they have printed their book by offset. They may have used a unique size and format that can’t be replicated by digital printing. They might have cover finishes and paper stock that are simply unavailable to you. Customers see this, and you look worse by comparison. They have professionals working on their books. Over at Old Model, editors, designers, cover designers, and proofreaders who have spent their careers learning their craft are working on their books. They bring years of experience and knowledge to bear on every project. Even though Old Model may not do as good a job as they once did, they are still light years away from you and the amateurs who have helped you get your book ready. They have a better economic model. You thought you were clever to try to compete with your print on demand distribution model, and were happy you didn’t have to lay out a cent to get your book into print. You thought that this was the new, the modern, the twenty-first century way to publish, and that those old fogies haven’t caught up yet. But their offset-printed book costs them one-third what you are paying for your book. They can price you out of the market without breaking a sweat. You will get hammered in the market if you don’t revise your plan. To be competitive, you will have to fight fire with fire. How to get a leg up so you’re not at a competitive disadvantage? Hire professionals. Part of the collateral damage from the economic difficulties book publishers are experiencing are the many people who have been laid off by Old Model publishers. Lucky for you. They are now available as freelancers to work on your book, bringing all that same expertise to bear. Consider your strategy. Think about your aims. If you are dead serious about trying to get national distribution into bookstores, you will almost have to print offset. You need both the inventory on hand to ship to distributors and wholesalers, as well as the leverage of low unit pricing to make the whole chain of discounting work without an inflated retail price. Don’t try to do it all yourself. 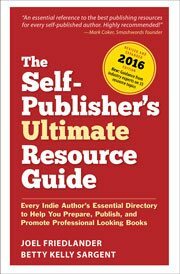 Authors who decide to self-publish need to realize that self-publishing does not mean you do everything yourself. To succeed against these Old Model publishers, you have to treat your operation as a business. You should be spending your time writing and marketing your book, not trying to figure out why Microsoft Word keeps changing your page endings every time you save your file. It’s possible today to retain the editors, book designers, cover designers, and proofreaders to make your book equal to any book on the market. If you treat it as a business, with the clear motive to make a profit, you will find the professionals you need to help you succeed. If your aim is to create a book for your personal use, or to leave as a family history, or to collect recipes for a fundraiser, you can safely ignore all of the advice I’ve given you above. But if you aim to compete, to establish and run a business that publishes your books, do with seriousness of intent. Commit the time, energy, education and resources to make your book truly the equal of anything else on the market. In fact, you can turn this situation to your advantage. By creating a well-edited, attractively-designed and intelligently marketed book, you can act a lot faster than the Old Model publishers. This becomes your competitive advantage when you realize the power of being able to react to events faster than your competition. And if your aim is to attract a contract from Old Model, your top-quality book could become your best calling card. If you’re largely concerned with sales, know that when your ideal customer stops at the table in Border’s, they won’t hesitate to pick your book up. And you can take that to the bank. This is what i’m talking about. Good to know theirs still people who believe in indie authors. It’s also good to know there is knowledgeable folks out there to help us up too. I have a team, small, but qualified. Working on the edit notes right now for my next novel. My book designer is creating. It’s hard work and for one of my novels, I’d be thrilled to have the traditional treatment, but preparing for its appearance after this is done. Joel, You are a publishing pro; I am a self-publishing enthsiast. I encourage newbies to publish for free by doing everything themselves. If you were limiting your remarks to professional writers, I would agree with you; however, I believe the majority of those “millions” of writers are amateurs who will be lucky to sell a hundred books. If one is lucky enough to write a winner, one can always go back and hire professionals to enhance their writing and their book design. Great post. I’m midway through the process of getting my book finished. Any ideas for finding an editor that specializes in the genre of your book? We found a fantastic, genre-specific editor on Elance. You can easily post your job on Elance and in within days, your inbox will be full of attractive offers from professional editors. Be savvy about checking their profiles and references, and you are on your way to putting the finishing touches on your book! Good luck to you, hope all goes well with the project. I knew I couldn’t do it on my own from the start and established Who Dares Wins Publishing. My business partner, Jen Talty, works full time at keeping the company going with covers, uploads, blogs, web sites, you name it. There is no way I’d have the success I’m currently enjoying if I didn’t have a team. @Chris, thanks for the thought. Getting a quality book–and why would you want to publish anything less, especially since it has your name on it–is a collaborative process that involves a number of people working together to pull it off. Although writing is pretty solitary, you really have to become a “team player” when it comes time to get your book ready to launch. Very well said Joel. It can be tempting to try and do it “on the cheap” but the amount of work involved in doing your own book is much much more than you’ll ever realize when you start. A book designer and editor are MUSTS if you want to do it right.